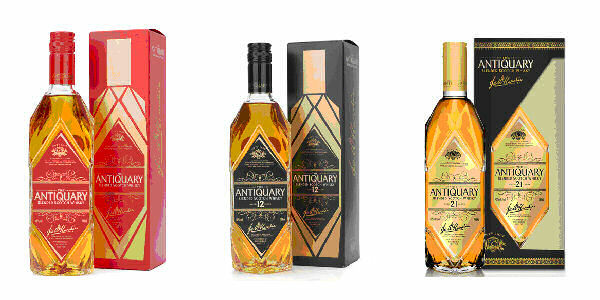 The Tomatin Distillery Co Ltd has given its premium blended Scotch Whisky brand, The Antiquary, a new look in a move to give it a new lease of life, while still retaining the history and provenance of one of the oldest Scotch Whisky brands in the market. The iconic diamond cut bottle remains, however it is in a taller, sleeker, and more sophisticated form. Pocket Rocket Creative has designed new labels and secondary packaging to highlight the unique shape of the bottle which, aside from the high content of malt whiskies inside, is arguably one of the brand’s biggest selling points. The Antiquary, along with its 12 year old and 21 year old expressions, is sold worldwide, with significant market success in France, Portugal, Russia, Angola, UK and the USA. The new label designs were trialled in Chile in 2014 and will now be rolled out worldwide.